Scranton attorney Michael Roth has been fishing since 1959, and has traveled around the world to pursue his hobby. “Fishing simply takes me to amazing places,” he told me, “from Alaska to Panama to the Eastern Caribbean.” In January, Roth went on a fishing trip to the Turks and Caicos. While targeting sharks off Provo, he saw a huge blacktip shark cruise by and threw a red and orange fly in its path. 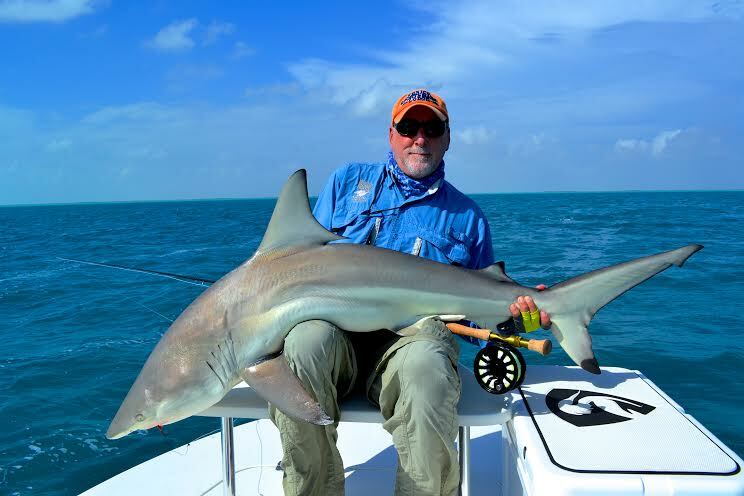 According to the International Game Fishing Association, the largest blacktip shark ever caught using the gear Roth was using (a fly rod with M-10 KG line) was 77 pounds. This blacktip was over 120 pounds, and would have easily set a new world record for this line class. However, International Game Fishing Association regulations require that animals submitted for a record must be weighed at an official weigh station. In this case (and in many other cases), this would have required killing the animal, as it would not have survived transport to the weigh station. Instead, Roth took a quick photo and released the shark. New “Rescue a Reef” citizen science project focuses on coral restoration. You can help! A real record holder indeed ! Thank you sir ! for such beautiful gesture ! As far as I’m concerned, he’s got the record for all time! What a great approach! Thank you sir. Great catch followed by truly honorable, compasssionate action. Thank you! A true sportsman. Well done. Great story and great catch! Just one point of clarification. IGFA has had many, many sharks (especially blacktips) that have been caught, documented, quickly weighed and released in great shape. The largest of which was a 300+ pound lemon shark that was caught, transferred in a live well and safely weighed in a sling before it was revived by the angler and swam off. Thank you for the clarification, Jason! In this case (and in many other cases) that wasn’t possible due to the distance from shore and the available equipment on board. Great story. Beautiful shark. Intelligent Man. Love him for releasing this Beautiful creature : ) Wish more people thought like him. At least the shark got to sit on his lap for a minute before going back to it’s life in the ocean! Honestly, since I experienced scuba diving, I haven’t had much desire to go fishing. It totally changed my perspective. It almost felt like fish and other sea animals were sharing their world with us and it was, quite possibly, the most peaceful situation I have ever experienced. Trust me, go diving. It’s way better than luring an animal out of it’s environment with a sharp hook and some fishing line, taking a picture of it while it’s suffocating, and tossing it back in the water, hopefully not fatally injured. If I ever do go fishing again, I would do it with the intention of harvesting a catch for dinner. Otherwise, I’m am going to put on scuba gear and enter into their amazing world and witness them in their most beautiful and natural form. There is no better way to see the ocean and it’s creatures than diving, it’s an amazing experience. Bravo Michael Roth Bravo! You are absolutely the record holder and a wonderful example and earth ambassador. Thank you for setting such a fine example. this is so great! I love this guy!